Every single morning, before I eat or drinking anything—and that includes my coffee—I reach for a big glass of lemon water. I squeeze about half a lemon into 12 to 16 ounces of room temperature water and sip. So simple, yet so good for your body! This has always been of my favorite tips to share with people who ask for an easy, start today tip, for better health. Lemons are not just a cute garnish for your glass! You should be gulping lemon water down daily, and here are 5 reasons why. When you drink lemon water, you are actually helping to cleanse your body. Lemon juice stimulates the natural enzymes in the liver, which in turn, helps it to flush out toxins! Consider it nature’s built-in detoxifier: starting your day with lemon water helps to reset your body for the new day ahead. Contrary to what most people believe, lemon water, although acidic in nature, is actually treated by the body as a base once ingested. Most of us tend to consume an over-abundance of acidic foods, thus lowering our body’s pH level. Lemon water can help the body maintain a balanced pH state, alkalizing the blood and reversing the negative effects of highly acidic foods. Lemons contain a soluble fiber called pectin that has been shown to help with weight loss. And since liquid calories add up faster than we’d like to believe—think about your morning daily Starbucks with whip for a second—lemon juice is a delicious way to add variety to your water without calories! Swap your daily can of Coke for a glass of lemon water and save 51,000 cals or 15 pounds a year! When you think of an “immune boosting” fruit, oranges probably come to mind, right? Well, lemons should be included on your shortlist, too! 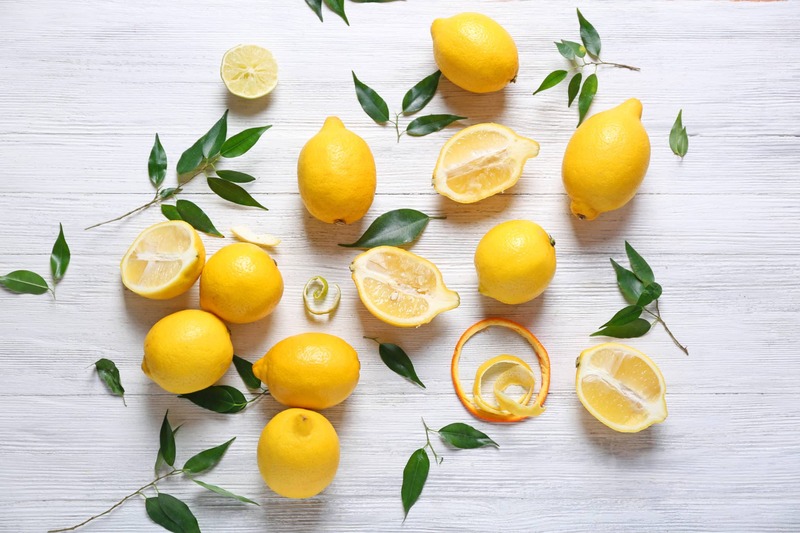 Lemons are high in both potassium and Vitamin C. The potassium will stimulate brain and nerve function and help control blood pressure, while the Vitamin C will help against colds and the flu. A study in the “International Journal of Food Sciences and Nutrition” released in 2011 stated that taste receptors for bitter substances trigger your pancreas to secrete digestive enzymes and your gall bladder to release bile. This helps the digestive process along and makes the process of eliminating waste products from the body easier, which, let’s be frank, is a great thing! But Wait…Is Drinking Lemon Water Bad For Your Teeth? Some people claim that drinking lemon water can wear away the enamel on your teeth. If you are concerned about this, know that for one, I have never experienced that (nor has my mother who’s been drinking it daily for her entire life!) but if you feel your teeth could be susceptible to this, there are some precautions you can take. 1. Drink room temperature or cold lemon water instead of hot. This reduces the amount of acid. 2. Use a straw to drink your lemon water. This way, your teeth will not have as much direct contact with the lemon water. 3. Use 100% pure lemon essential oil instead of actual lemons. If you use a kind that is 100% pure (do NOT ingest synthetic lemon oil!!!) then lemon essential oil can be just as good as using actual lemons. I sometimes use the Young Living lemon oil instead of a lemon, and it’s believed that the oil has less acid than the fruit. So, if you’re worried about your enamel, don’t sweat! You can still enjoy lemon water by utilizing the above tips and protecting those pearly whites. lemon water does not go well with my hiatal hernia. Do you have any other suggestions? I have a hiatal hernia and lemon juice aggravates it. Is there anything else you recommend? Hi Julie - Oh I am sorry to hear that the lemon juice does not sit well with your stomach. Have you ever tried drinking Kombucha? Kombucha is one of my favorite things to drink throughout the day and it's really good for your gut health. It's fermented and I personally think it tastes really good. Let me know what you think! I drink an 64oz tumbler of lemon and lime water everyday for the past two weeks, it’s very refreshing, a good cleanser and lost inches and pounds from my stomach, I will continue drinking this! Hi There - Wow!! Congratulations and way to join in on drinking Lemon Water everyday! You are most certainly right, it is very refreshing! Keep drinking lemon water and hope you continue to feel well doing it, such a great way to start your day! Can you use the squeeze bottles of the lemon juice they sell @ the groceries? And f show much? Bea - You most certainly can if that works better for you. However, that is not going to be fresh lemon and may have some other additives in it. I personally enjoy just squeezing a quarter of a fresh lemon in my water and dropping that quarter of the lemon into my water for freshness. How many cups of lemon water should I drink a day ? Hi Brandon - I start my day with half a lemon in 12-16 ounces of room temperature water. This should be enough to reap the benefits and then I make sure to drink lots of regular water throughout the day. If you like the taste of lemon in your water and it helps you drink more, then by all means you can do more! Can lemon juice dissolves kidney stones?I have 3mm on left and 4mm on right,suggest me a way to dissolve kidney stone. Hi Raja - that's something to talk to your doctor about! Just recently I started adding 100% lemon juice to my daily water intake. I purchased 2 large bottles of it at Costco. Amazingly it has helped to mostly eliminate arthritis pain in my hips!! Not sure how or why!!!! Always wondered is True Lemon would work? I’ve used in the past and noticed it in the advertisement within your article which reminded me. Thoughts? How much lemon EO when you don't have fresh lemons? Just a drop or two should flavor it!